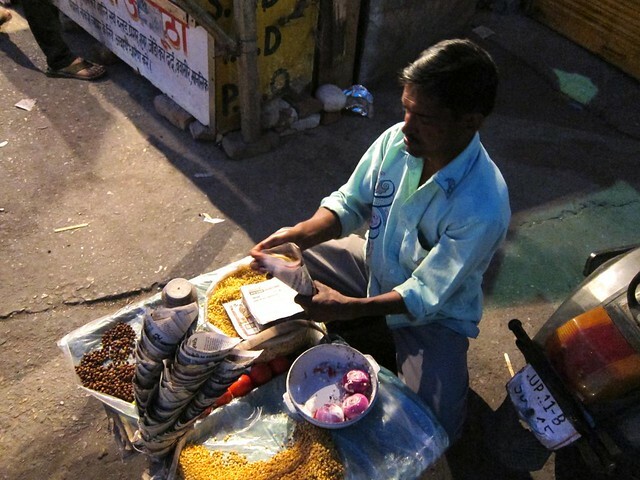 Far Out in Rishikesh – snackettes. Amritsar was our favorite stop in India yet, but despite its charm, we’d seen enough busy Indian city life for a while and were ready for some rural change. Uttarankand, a state in the east of India, bordering Tibet and China, appeared to be just the speed we were after, and specifically, a mountain village called Chopta was recommended in several trekking blogs, so we decided we’d head there next. Chopta is fairly remote, however, and even given the vast reach of India Railways, it seemed that from Amritsar, you really “can’t get there from here…” So we decided to break up our transfer with a quick stop in Rishikesh: the birthplace of yoga and home of the ashram that hosted the Beatles on their famous east-meets-west vision quest, during which they wrote most of the album Abbey Road! The train to Rishikesh was our first foray into first-class Indian Railway accommodation, which we quickly learned is a relative distinction depending on the route. The first class cabin on this particular train did provide us a private room for our bunks (shared with one other person on her way to Dehradun), but it ended up being a lot less comfortable and with fewer amenities than our previous 3rd class rides – no bed sheets, no power chargers, no pillows, and completely freezing – a bummer, and little did we know, an appropriate foreshadow of what was to come later in the week! Soon enough though, we were in Rishikesh, and we detrained and spent our morning as we usually do on connection days: haggling with tuk-tuk drivers over ridiculous overprices, never knowing if they actually knew of the address to which we were going anyway, and eventually resorting to looking for a way to get to our hotel without their help. More on that: one curious recurring trend we noticed in India is this unwavering desire people have to not disappoint when answering someone’s questions, or at least that’s how it’s been ironically described to us… When you ask directions in India, or ask if you’re headed in the right direction to a particular place, or if a store has a particular item in stock, you’ll often get a positive answer (“yes, it’s that way”), or at worst a vague, “we’ll see…”, even if the person giving directions has no idea where to point you. Picture this: you’re asking how to find a particular monument in town, and regardless of whether the person you’re asking has any idea of where or what that monument is, they’ll point you in a certain direction with a smile. Hooray for not disappointing anyone! A girl about our age overhead us talking with one of the tuk-tuk drivers and decided to nicely intervene, telling them in Hindi exactly where we were headed, and even climbing aboard with us to ensure we got to the right place! Sure enough, we did, but the hotel was booked, so she then proceeded to direct our driver to other guesthouses in the area until we finally found a suitable spot. 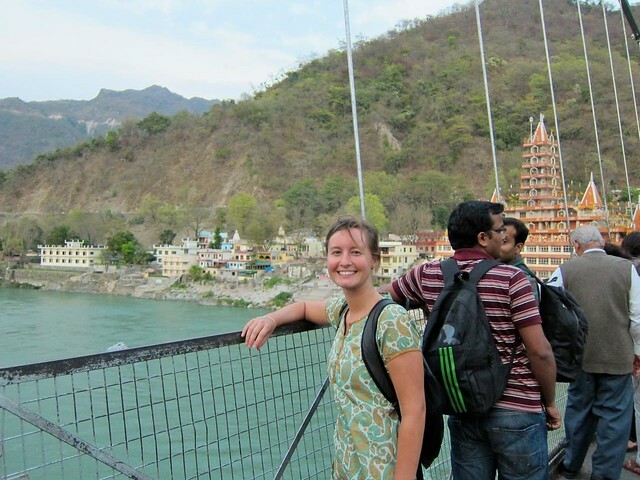 Along the way, we learned that she was a yoga teacher, visiting her parents in Rishikesh for a week or two, and in keeping with the hospitality we’d seen many times in India, she even invited us to have tea at her parents’ place the next day (that unfortunately never panned out). 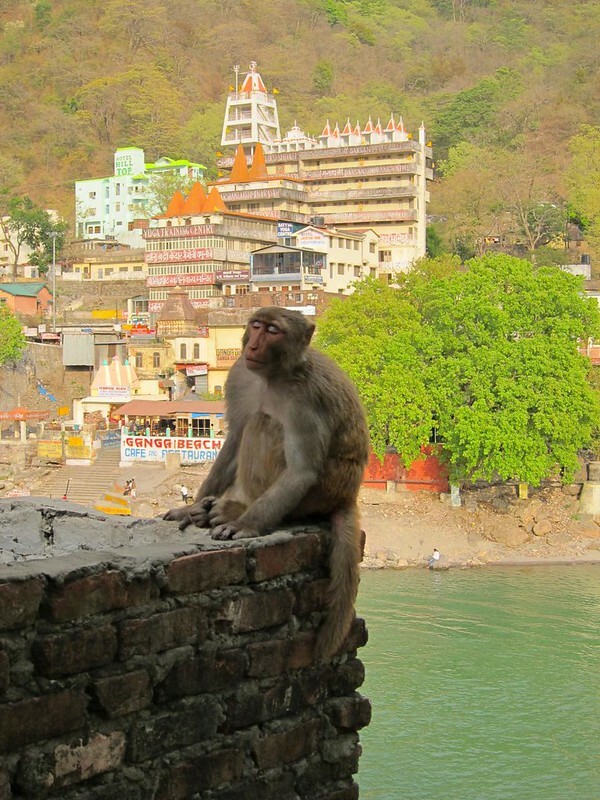 We only spent a couple of days in Rishikesh, and we unfortunately did not get a feel for what many people appreciate about the city. To us, it appeared to be the Gatlinburg, Tennessee of India, with hokey trinket shops and packaged excursions for Indian tourists. We assumed that the ashrams people come to visit from far-and-wide were on the outskirts of town, since the typical blaring of horns and city noises made the city seem like the most unlikely of places to enjoy a yoga or meditation retreat (perhaps people enjoy the challenge?). 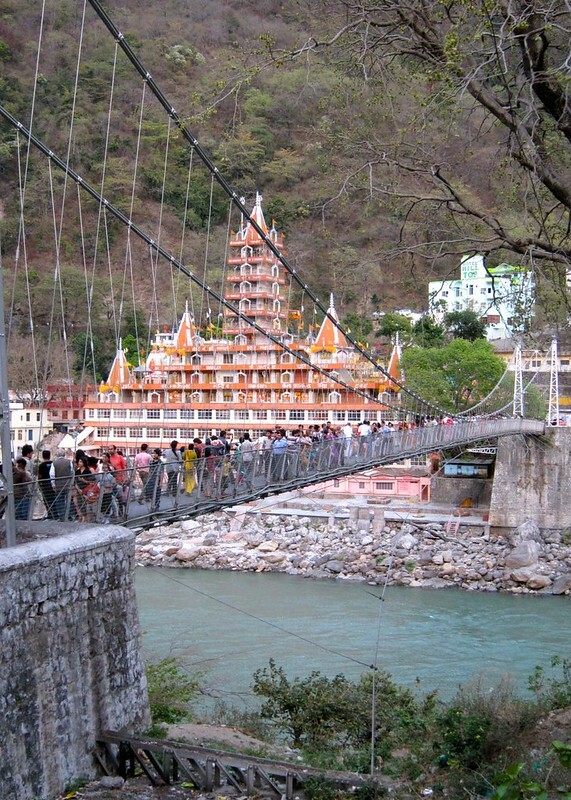 But Rishikesh did provide our first sighting of the Ganges, the holiest river in India, and that alone made it a worthwhile stop. Beyond the Ganges, the cafes in Rishikesh made for a good place to research and arrange our transport to Chopta, plan any trekking we’d like to do while there, and stock up on cheap, warm North Fake gear for the weeks ahead. After a couple of days, we were very ready to move on, but perhaps we missed out on the “real” Rishikesh… I guess we’ll never know.